chmod 644 – World Readable: a personal blog about anything that comes to mind for anybody who cares to read it. Time for the spring sports update! After a record-setting season (winning 62 games and the President’s Trophy for the first time in franchise history), the Lightning imploded and got swept out of the first round of the Stanley Cup Playoffs in embarrassing fashion by the Columbus Blue Jackets. Ugh. No Cavs (or even Lebron!) in the NBA playoffs this year, so I’m not watching any basketball. That leaves just baseball: at 14-5, the Rays have the best record in baseball three weeks into the season while the Indians were off to a slow start but are still above .500 at 11-7. What else? Oh right, it’s mid-April which means it’s time for the latest Ubuntu release, 19.04 Disco Dingo. This week Microsoft released the first preview build of their Chromium-based Edge browser as part of the Edge Insider Program. Can you see a difference between Edge and Chrome? 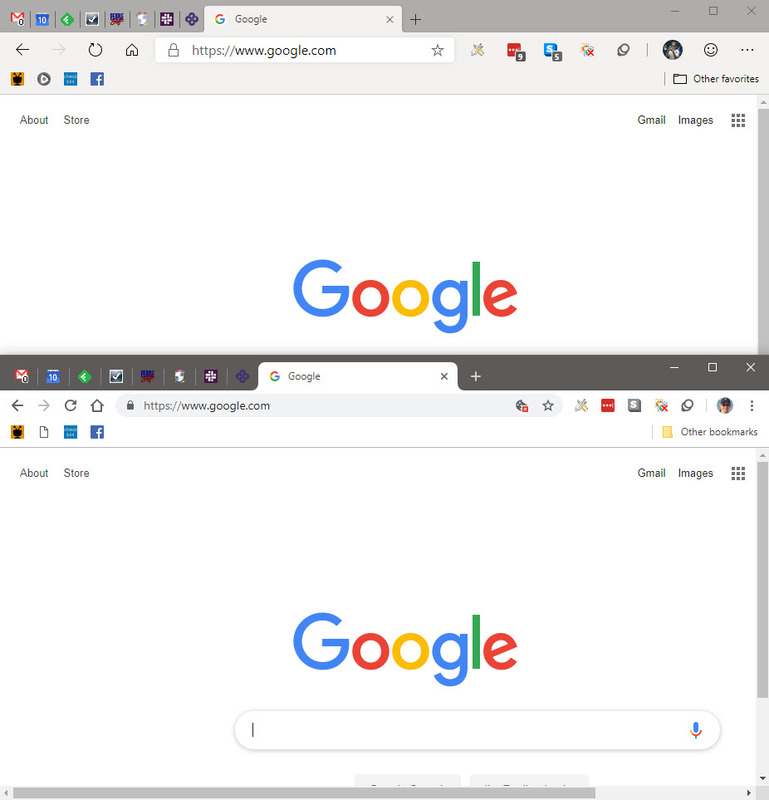 Visually similar, you can currently tell, based on the iconography, that the new Edge is on top and current Chrome is on the bottom. I can say this is the best Edge browser I’ve every used … because right now it’s basically Chrome. I was able to install all of my extensions from the Chrome Store, import all my bookmarks, settings, etc. and have it work exactly like Chrome. The only difference is I logged in with my Microsoft account instead of my Google account. It was barely Sunday morning (3:00am) when we left the hotel and drove back to the rental car facility at Sky Harbor Airport. By 3:30am we had returned the car and were waiting for the airport shuttle to the terminal. People were lined up (as they should have) for the various shuttles to specific terminals (1-4) but it turned out there were only a few shuttles running and they were servicing all terminals. This caused some problems as people patiently waiting in the line for terminal 4 realized the bus kept stopping at the terminal 1 line and filling up quickly. We finally got onto a bus with other exasperated passengers. At the Terminal 2 stop, my sister and I bid farewell to my brother (who was going on to the much nicer Terminal 4). The one benefit of the smaller (crappier) terminal, however, was the lack of lines. There were no lines to check our bags (Alaska for her, United for me) and we were the only two in the TSA PreCheck line (which amazingly was open at 4:00am). Unfortunately, once through security, nothing was open yet. I waited with my sister until she boarded her flight at 4:45am and then sat around for another minutes before boarding my own flight to Houston. I landed in Houston around 11:00am and had a normal length layover before my connection home to Tampa. By 3:45pm I was back in my car and then home unpacking half an hour later. Another Arizona Spring Training trip in the books! Saturday morning of the Spring Training trip has certain traditions and we continued them this year. First we woke up (relatively) early, drove over to Goodyear, and had breakfast at the Black Bear Diner. Then it was over to the Indians’ Player Development Complex to watch the morning warm-ups and practice at 9:00am. We were a little too early, as the inner gate didn’t open until 9:30am. This year, Rick Danberg seemed to be missing … there was no one talking to the crowd, giving out the day’s schedule, telling stories, etc. Everyone was just milling around waiting so I really missed his talks. We caught the occasional glimpse of a player in the weight room and also saw Terry Francona walk out to his car. The players didn’t actually come out to practice until around 10:40am, which seemed a lot later than in past years. We watched the warm-ups and then tried to shag some fly balls during batting practice (my brother and I came up empty, my sister got one though). I had sort of an anti-New Year’s resolution this year: drink more alcohol! Well, not exactly. What I resolved to do was to learn how to make cocktails at home. Until now, my homemade adult beverages consisted mainly of Seven & Sevens or the occasional Moscow Mule. But sampling a wide range of other cocktails on our cruise last year, plus tasting my brother-in-law’s homemade limoncello over Christmas encouraged me to learn a little mixology myself. 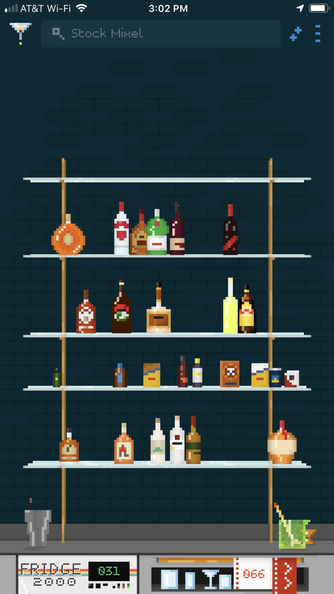 After stocking my home bar with the basics (vodka, gin, tequila, rum, whiskey, etc. etc.) and mixers (simple syrup, lemon/lime juice, etc. etc. ), I needed recipes. 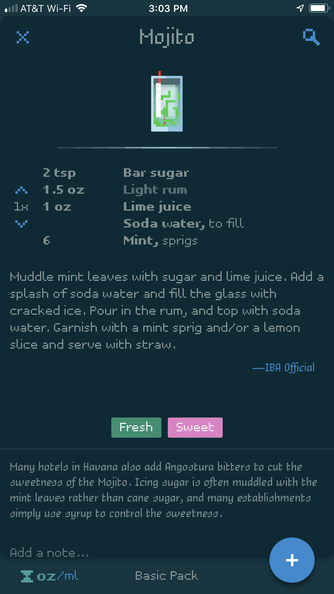 There’s no shortage of web sites on the internet (like liquor.com) for cocktail recipes, but I also wanted a good mobile app for my iPhone. After trying a few, I found Mixel. 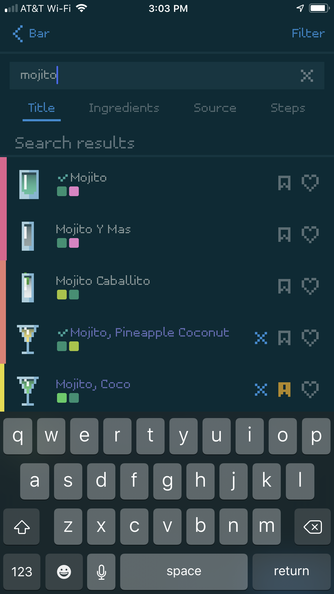 Mixel doesn’t just tell you how to make cocktails. 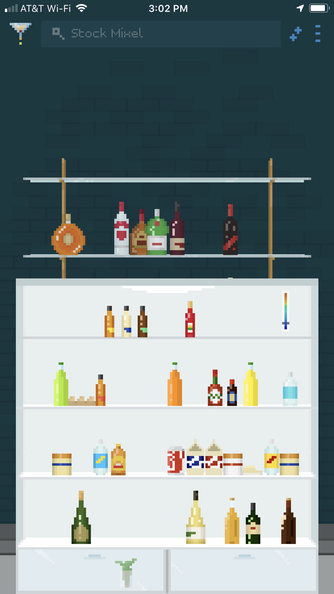 If you stock your bar and fridge with the ingredients you have on-hand, it will tell you what you can make as well. 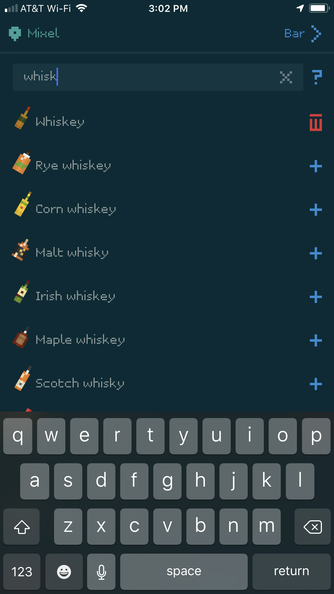 You can search recipes by name (“whiskey sour”) or ingredient (“grenadine”) and filter the results by ingredients you have on hand, different packs, drinks you’ve tried or bookmarked, etc. The app has about 500 built-in ingredients and you can easily add your own. It’s a lot of tapping, but you can add the ingredients, measurements, steps, notes, even customize the icon (glass type, liquid color, garnishes, etc.). You can also add and organize your own recipes into packs and even add multiple bars (I guess if you have one at home and one at the summer house?). If you don’t have an ingredient, you can add it to your shopping list (although that’s a list internal to the app and doesn’t integrate with any grocery shopping apps). As you might have guessed, it’s called Mixel because of the pixel art graphics which take me back to my King’s Quest days. You can change the color scheme and turn off the pixel font if you want, but I really like the look of the app (I’m using a dark theme, as you can see in the screenshots below). Mixel is a free, with in-app purchases (for more recipes than the basic 80 included in the free version). After using it for just a day or so I decided to go all-in with the Premium pack. 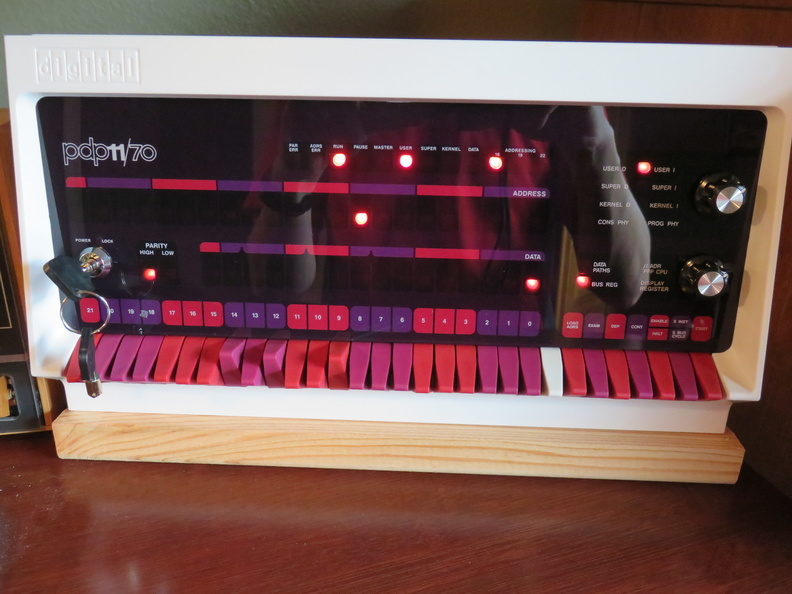 Three and a half years ago I built my PiDP-8 kit and it’s been happily blinking away on my desk ever since (it also runs my Pi-Hole). Earlier this year, on episode #698 of Steve Gibson’s Security Now! podcast, Steve mentioned that Oscar Vermeulen had come out with a new kit, the PiDP-11! I loved the experience of building the PiDP-8 and the quality of the final product so I immediately signed up on the mailing list to be in Oscar’s next batch of orders. I seem to go through technology re-orgs every four years or so. To start off 2019 I decided to re-do my security camera setup. My first cameras were installed in 2010 (Foscam outside, TRENDnet inside). In 2014 I switched my indoor cameras to Dropcams but since Dropcam (now Nest) didn’t have an outdoor solution at the time I went with PoE TRENDnet dome cameras outside. While this solution was perfectly functional and served me well for the past five years, it was a bit of a pain having to use two different apps to view the indoor vs. outdoor cameras. Now that there’s the Nest Outdoor (released in 2016 and then the IQ Outdoor in 2017), and I also have a Nest thermostat and smoke detectors, it was not a tough decision to consolidate and go with more Nest cameras.